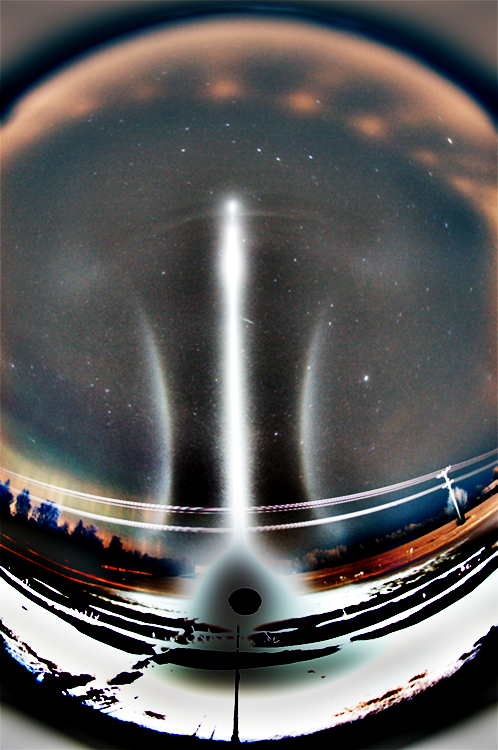 Here is divergent light subparhelia flanking the pillar. Spotlight displays are classical displays with little divergentness involved. 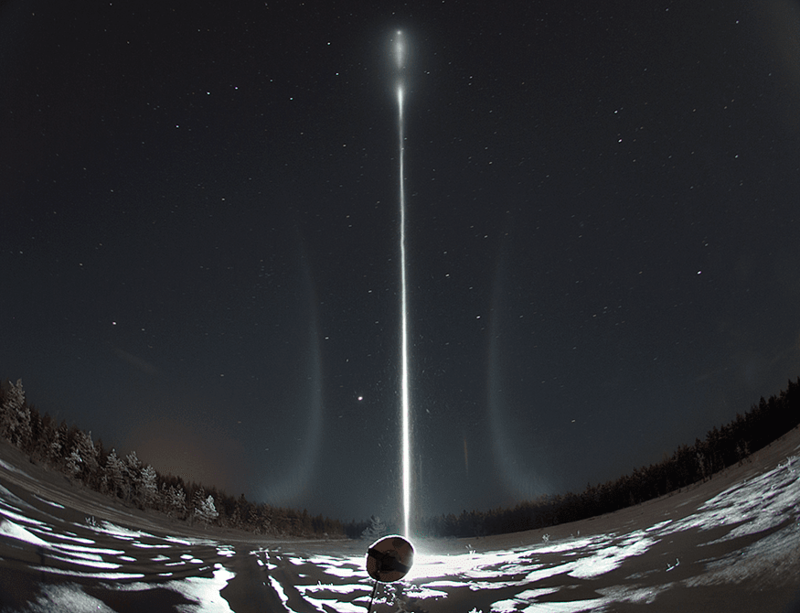 A way to create truly divergent halos with spotlight is to point it to the ground. The reflection from snow then acts as a divergent light source. 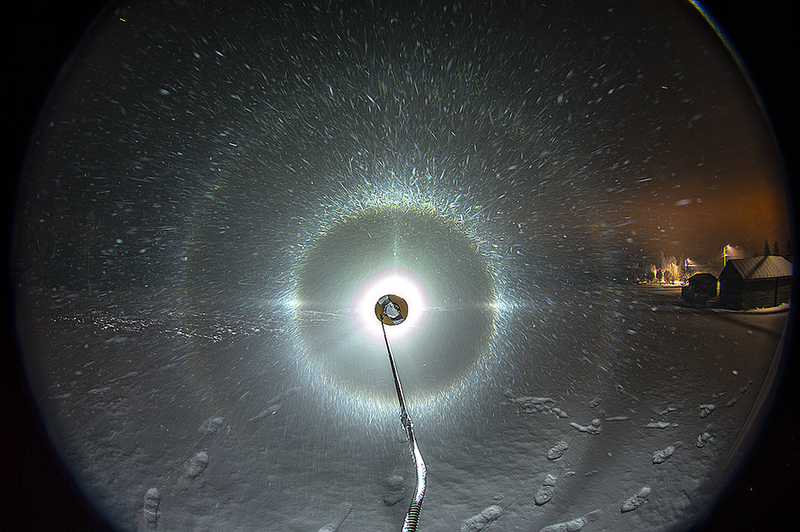 Another way that might work is to cover the lamp glass with a layer of snow. 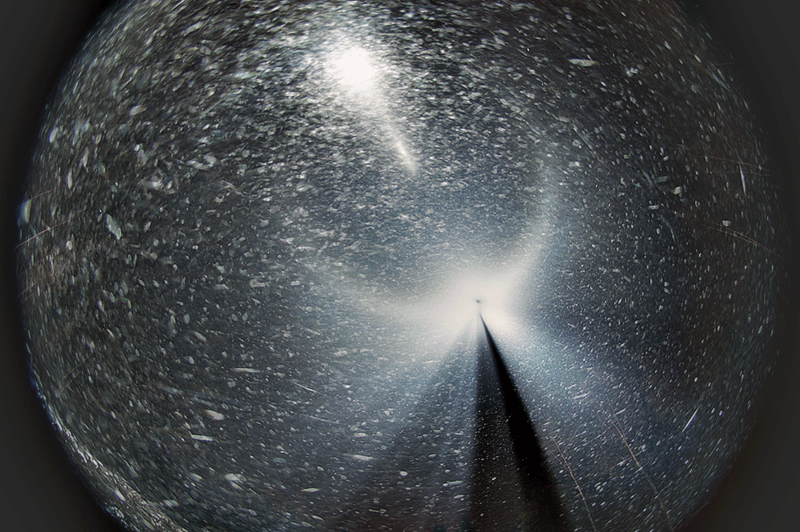 That would be a shorter lasting solution, though, as the heat of the lamp will melt the snow. Rovaniemi, in the morning hours of 19th January. 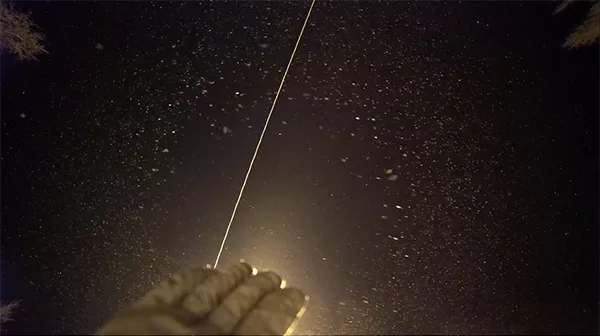 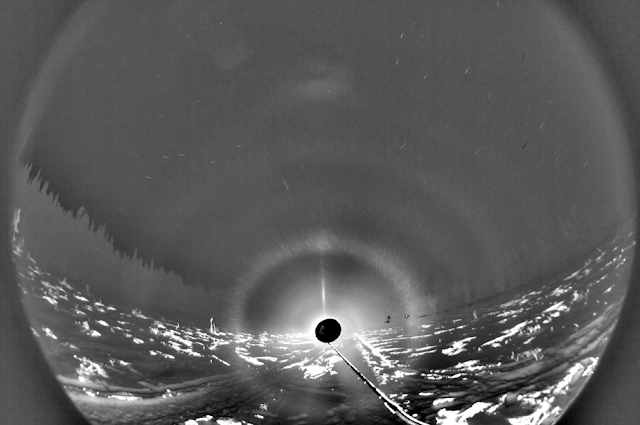 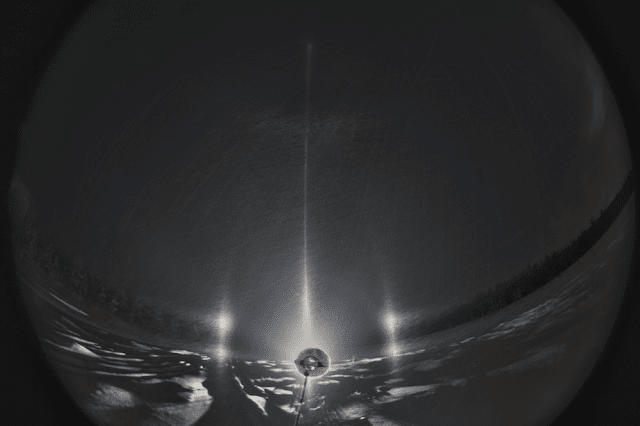 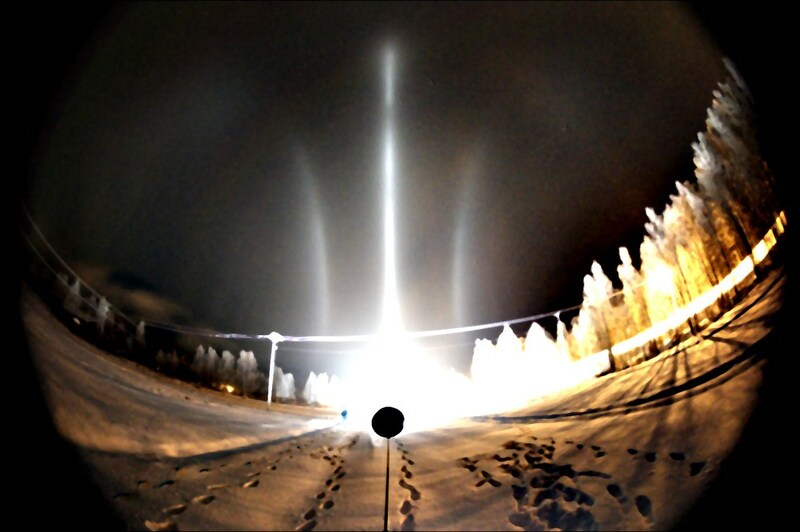 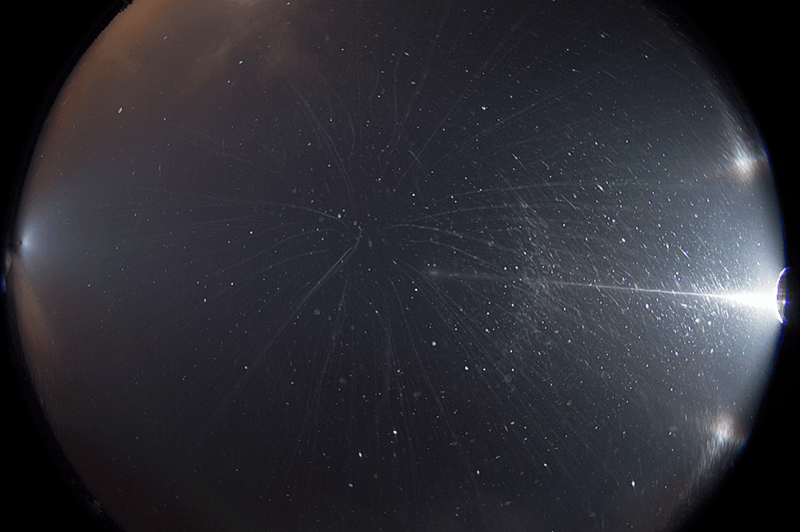 On the night of 6/7 January we had an anticipation that something unusual would occur in the beam because the temperature was forecast to drop below -30° C. It was clearly a dreamer’s thought, based only on the reason that no one had photographed snow gun originated diamond dust displays below that mark. 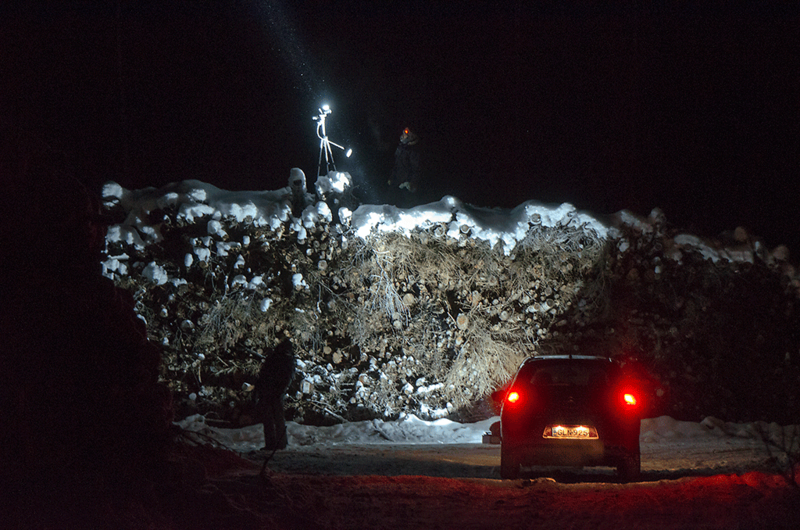 When we called it a wrap near the twilight hours, nothing out of the ordinary had happened. 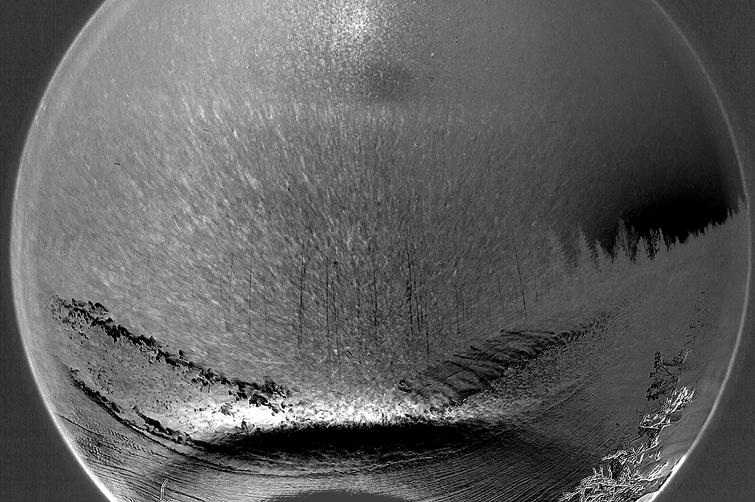 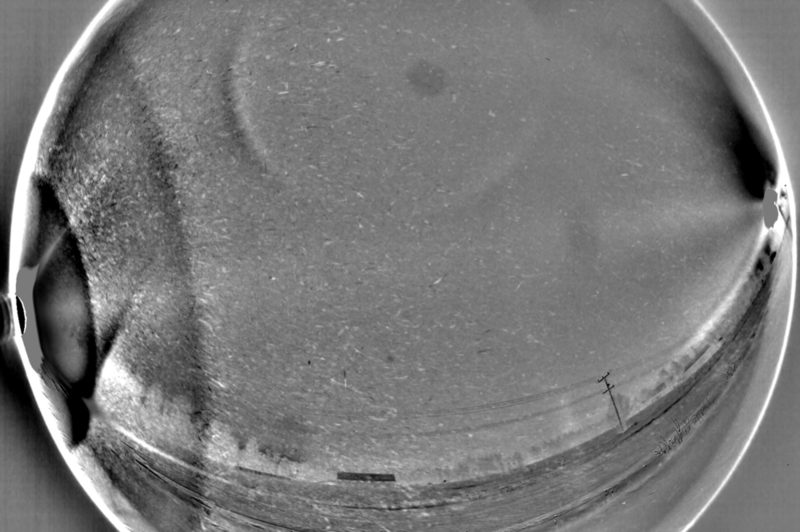 But after we woke up and started looking at the photos from the night’s plate displays, there was visible, next to the sub-Kern, an arc that we did not recognise. 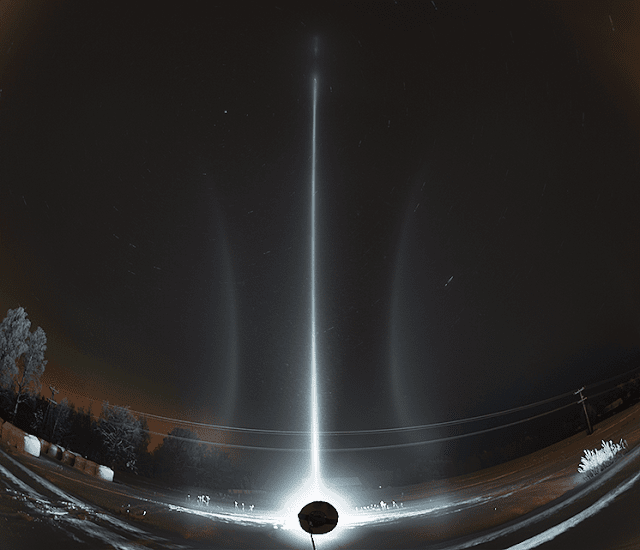 It was captured at two different locations with three hours passing in between. 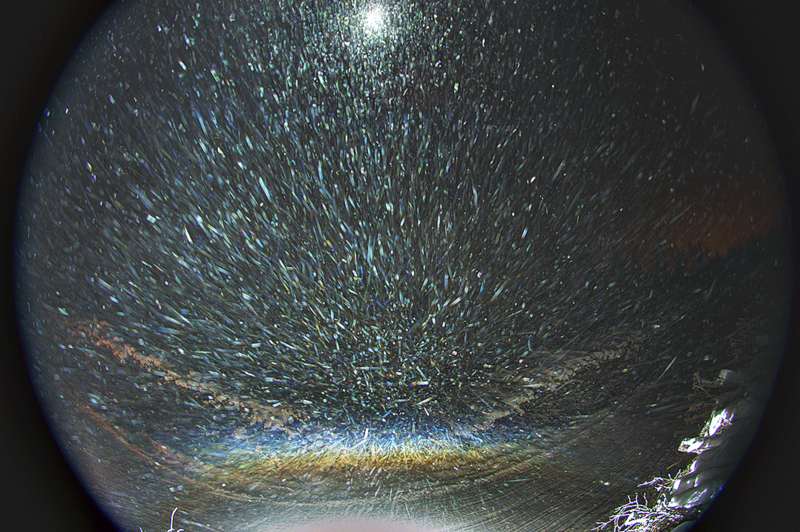 It is not that unusual to see a circumhorizon arc under a streetlight, forming a striking spatial shape. 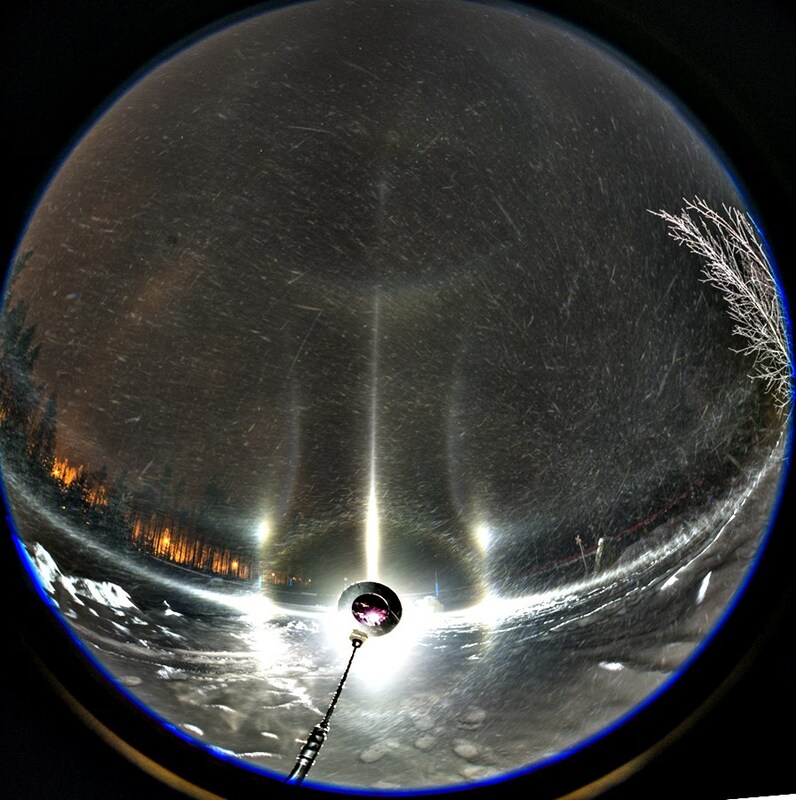 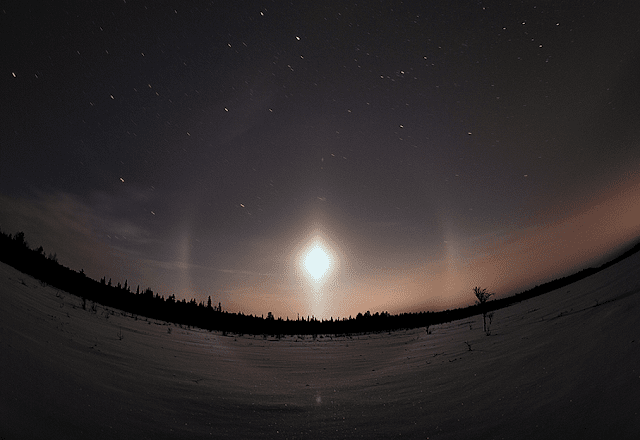 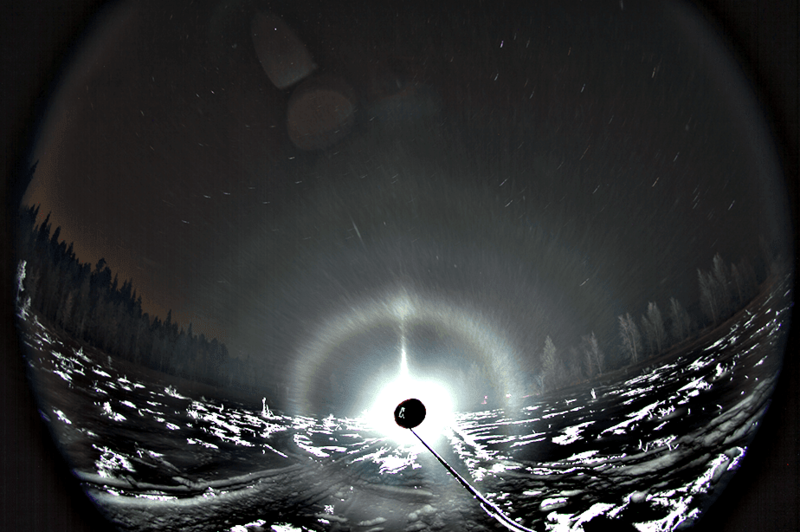 On the night of 6/7 January we gave circumhorizon arc a shot with spotlight as we arrived to a place where there were rather high piles of logs on top of which we could clamber while leaving the lamp on the ground below. 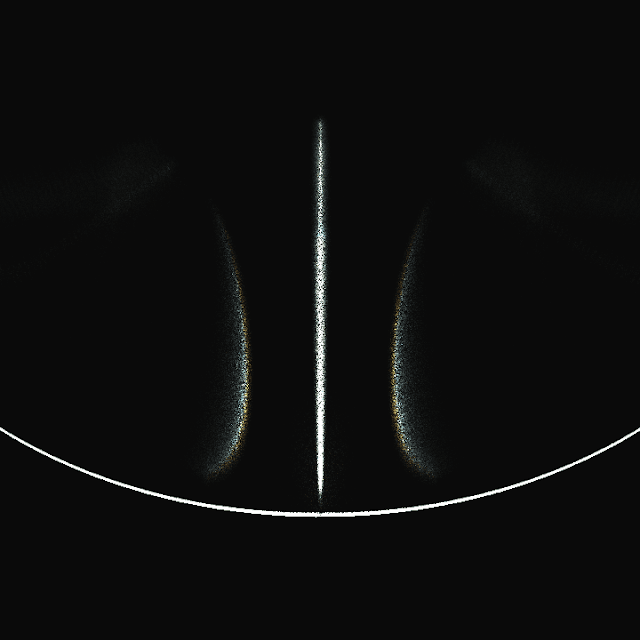 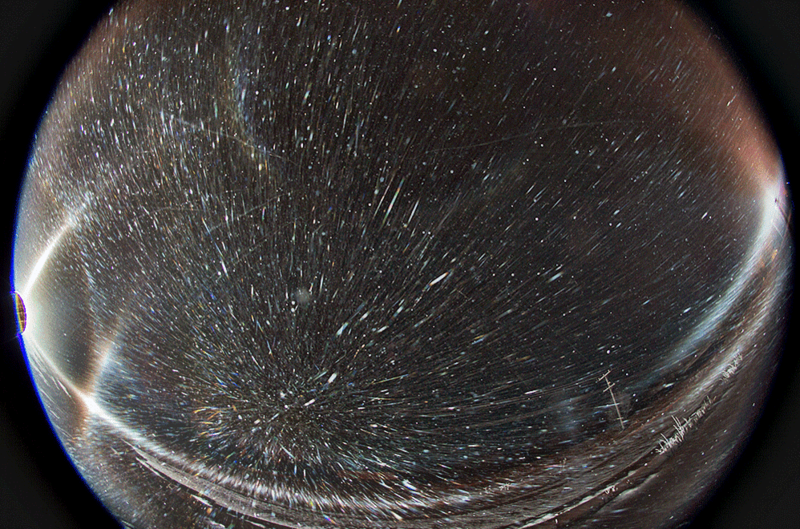 On the night of 6/7 January we gave a try also on another halo effect that simulations predict: the blue subsun. 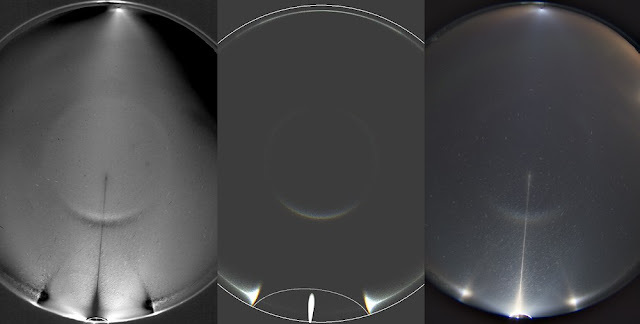 It is an effect in the blue spot and blue circle family and it colours the core of the subsun blue at 58.5 degree light source elevation. 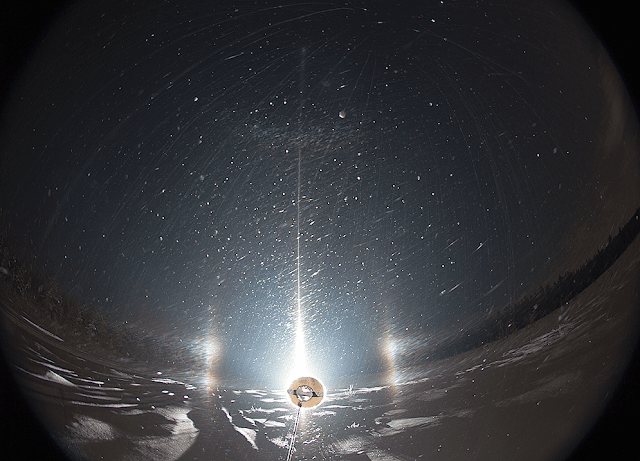 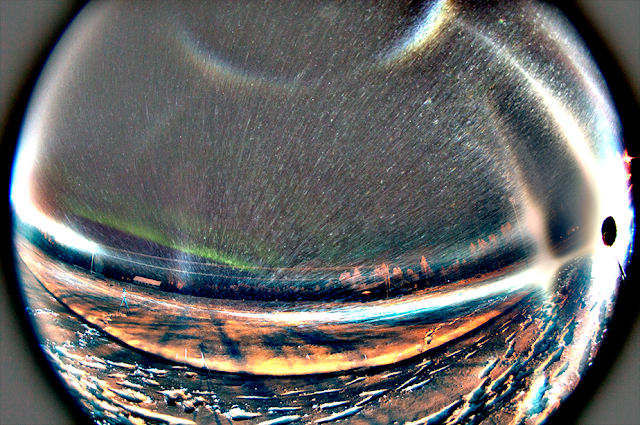 In another photo (below) the lamp was, according to simulation, at 57 degree elevation and the blue colour is on the other side of the subsun. 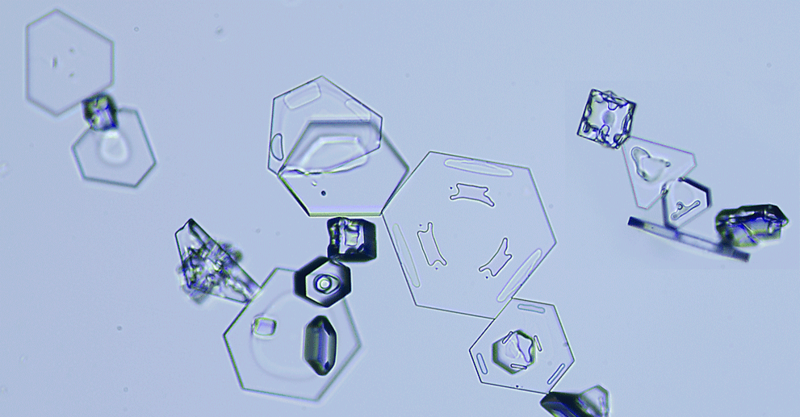 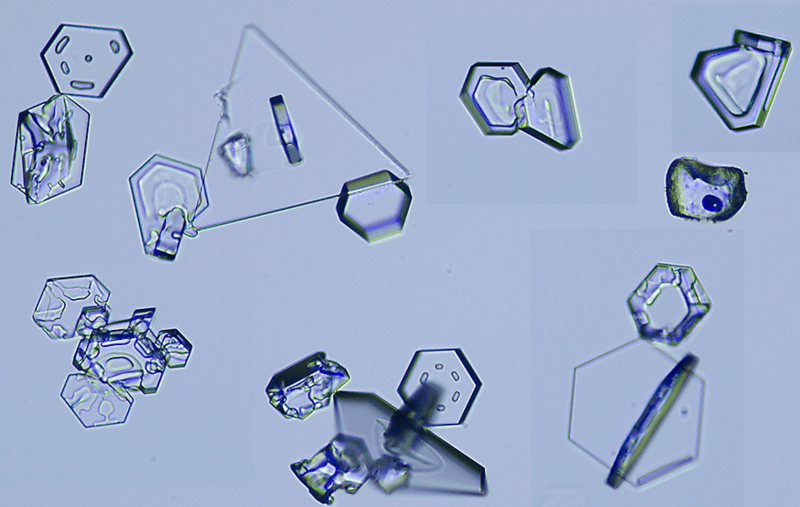 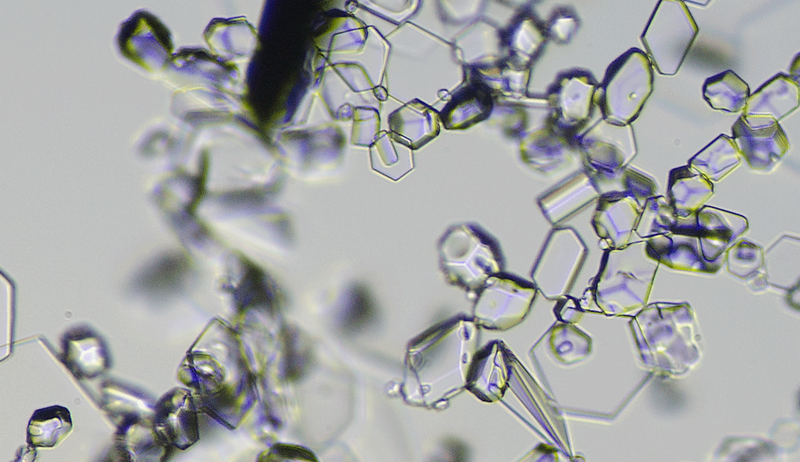 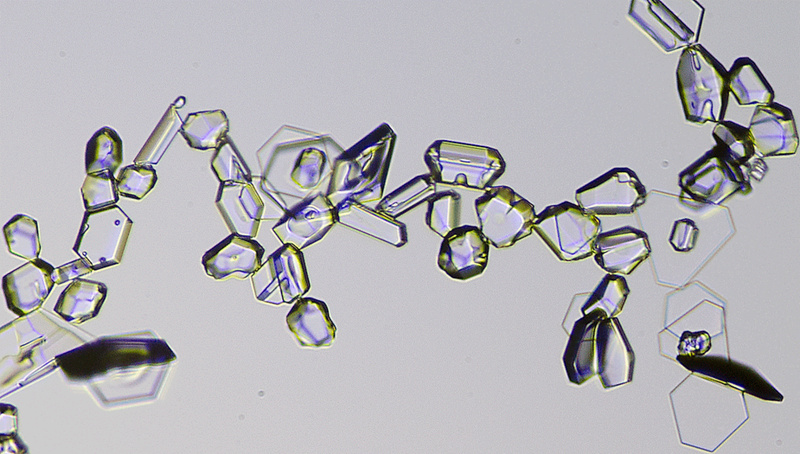 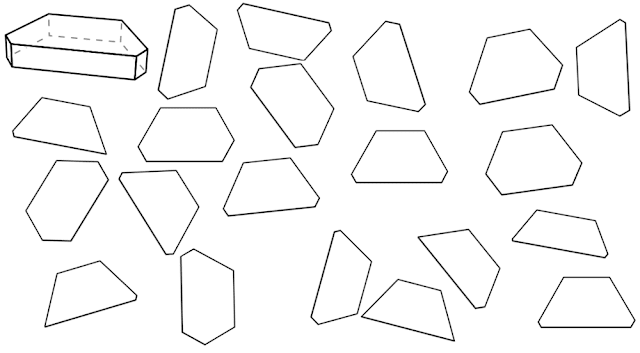 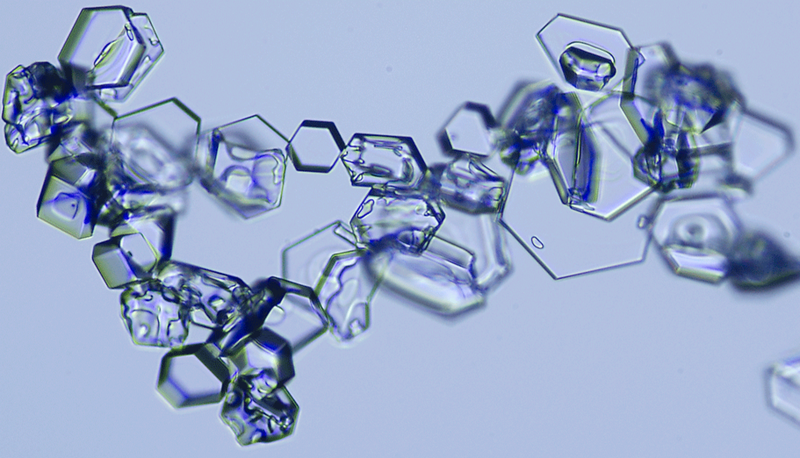 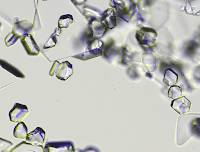 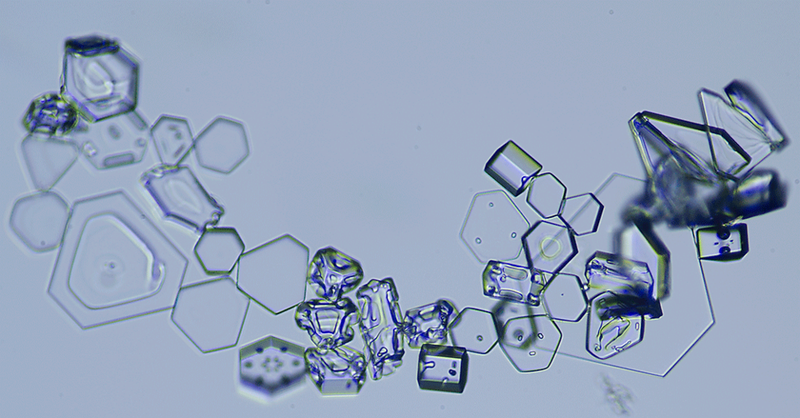 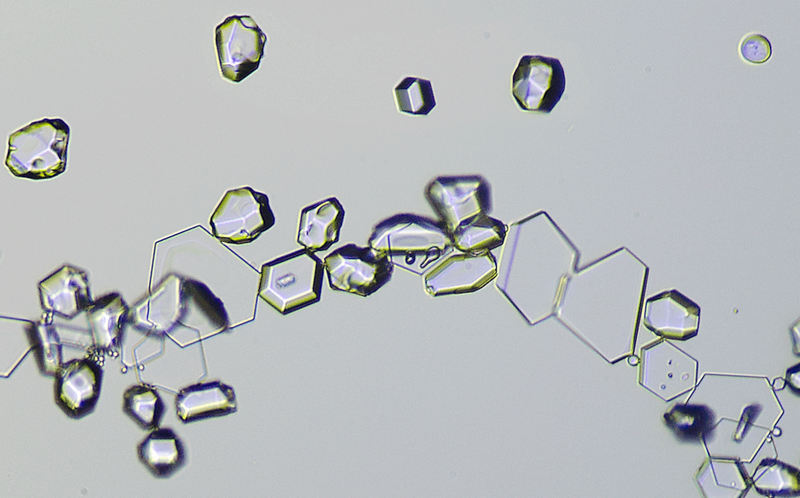 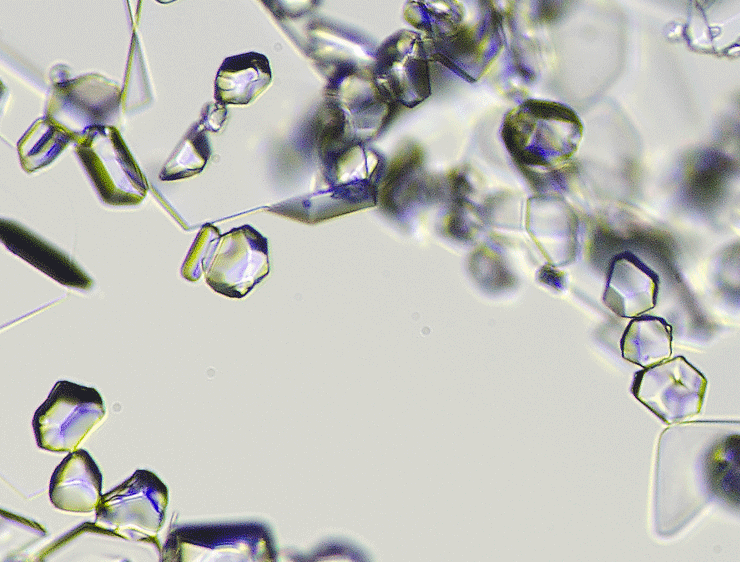 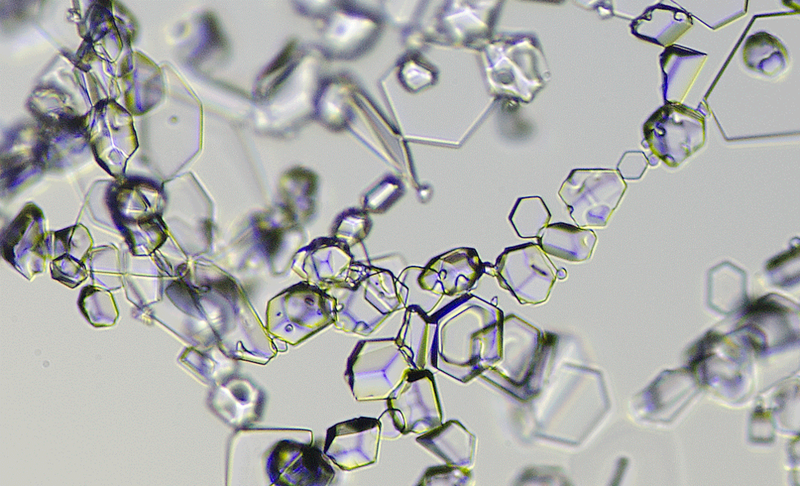 Shown are also crystals collected during the display and uncropped images. 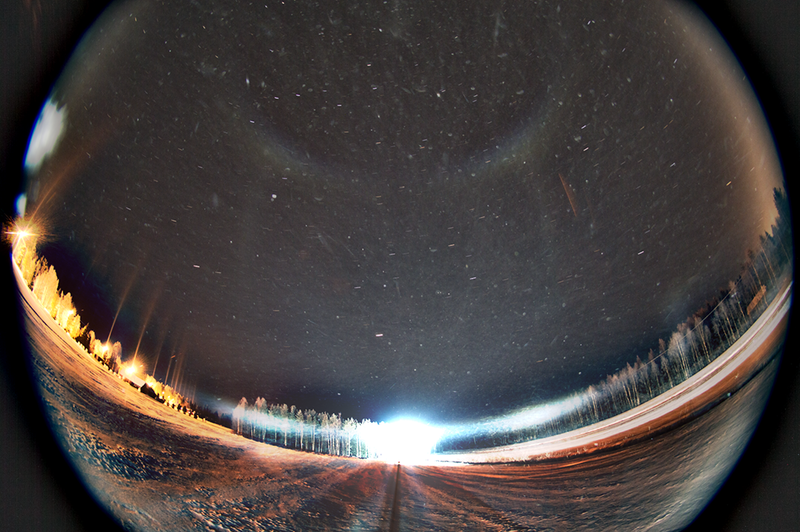 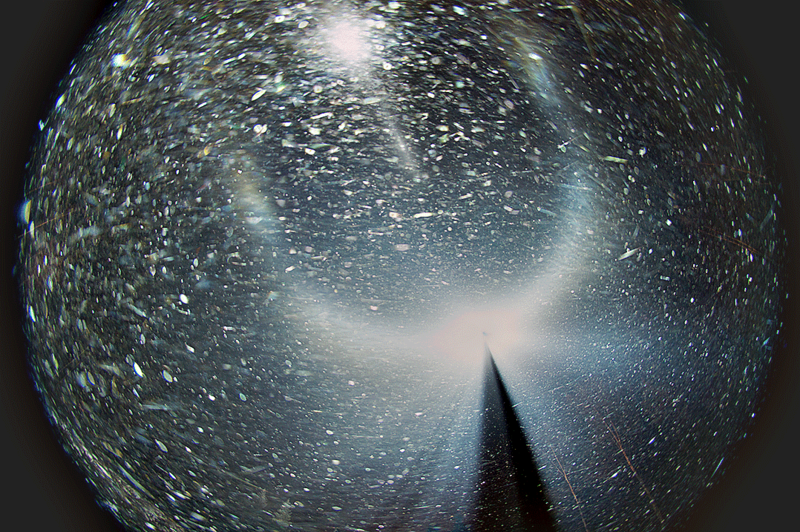 Here is a photo of a diamond dust odd radius display in the spotlight beam. 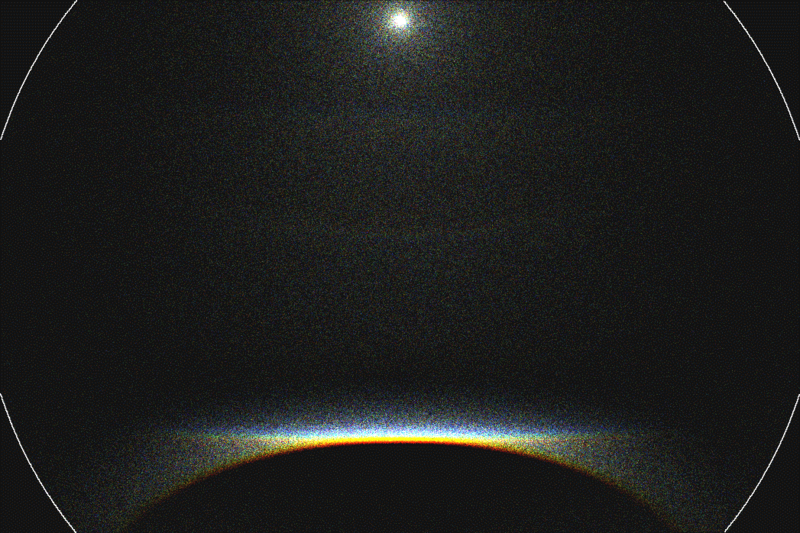 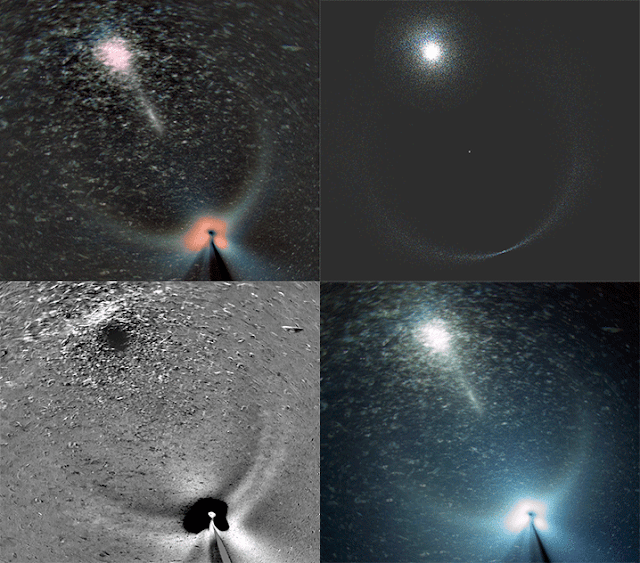 Of the less commonly seen halos visible are lower 20° and upper 35° plate arcs.